Hey friends. It's been a while since I just wrote something which is totally and completely self-indulgent on these pages. Somehow I've found myself snowed under with book reviews for our new website and Book Trust, meaning that very little has been written in the informal, terribly enthusiastic style you've become accustomed to. From a Brit's perspective, you do need to have an interest in what's going on in America (I do), and there are listings of events happening in New York which are (sadly) irrelevant. Other than that, it's pretty much the perfect magazine. 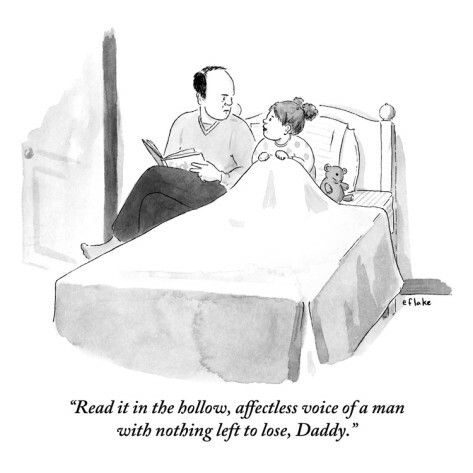 Balancing humorous cartoons and short columns, with incisive, investigative journalism, which succeeds in being highly intellectual, while demonstrating its writers' penchant for storytelling, The New Yorker is the best magazine I've ever encountered. Here we have real stories which interest me, a short fiction piece and poems in every issue (and the summer fiction special), film and book reviews, alongside articles which give voice to the disavowed, educate and entertain readers, while bringing to light some of America's dirty secrets. There are also the brilliantly drawn New Yorker covers (a beautiful surprise when it arrives in the post each week), and the fantastic cartoons (see above for a recent favourite). With various dissatisfaction in my life at the moment, and the feeling of being a bit 'stuck', the thirty to forty minutes I get before work to sip tea and read this magazine fill me with a deep and sustaining pleasure. This is an incredibly well-told story of a veteran who did not receive the psychiatric treatment he needed, and who ultimately ended up murdering two other veterans. It's a tragic true story, which feels so close due to Nicholas Schmidle's evocative writing. I felt that I knew the people involved, and it was the first New Yorker piece which made me feel like crying in despair by the end (that is supposed to be a good thing; we need people to tell the truths of the world). I loved this for entirely different reasons. Revealing the history and current most wanted in the rare egg world, this article had me cackling throughout. While the story itself is serious (rare birds are coming under threat from collectors), the humour with which Julian Rubinstein described the individuals fighting this niche crime, and indeed, the criminals themselves, was pointed and playful. This personal piece focused on finally having the much awaited guest room. Of course, it wasn't really about that - it was about family, relationships, and the bitter sweetness of getting older. A well-written, elegiac piece. Of course, there are many other brilliant articles, but these few perhaps show you the variety on offer from the New Yorker. It makes me think about my own writing. I'd love to be one of the exceptional writers the New Yorker employ (come on, who wouldn't want to be contributing to the same magazine as Woody Allen? ), but I don't know how to get there. Practice, I suppose, and time. I need to take more time for my writing.